While running errands, I spotted the item in this photograph at my local shopping center. 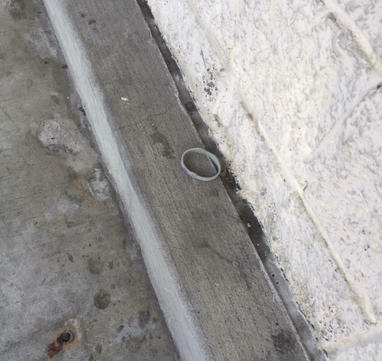 It’s a fitness-tracking bracelet on curb wall between stores. Completely unbidden, my writer-mind went into overdrive: – Why is it there? It seemed carefully placed yet there was no one around. – Did someone leave it there intentionally or did someone happen up on it in the parking lot and placed it there on the walkway, where it would be obvious to the person who lost it? – Did someone steal the item from someone they know then leave it there as a taunt? – Did someone get disgusted or frustrated by their lack of steps or whatever and they left it behind themselves? – Did someone intentionally leave it at the shopping center as a red herring, knowing these bracelets have GPS trackers? In the time I spent shopping for groceries and getting a birthday card for my mother-in-law, this little item I spotted in passing sparked ideas for a character and a story. I snapped the picture then sat in my car and jotted it all down. I find inspiration all around me, sometimes in the most random places. Where do your ideas come from?